Did you try to load metadata also from an rdbms source? thanx for the blog at first. it's very informative blog. i want to ask something. 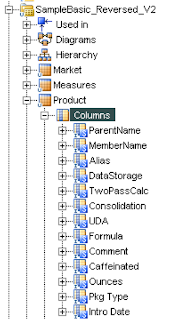 is it possible to create an Essbase database by using ODI ? I mean, at the examples we have an existing database. what if, we create a new app and database(just as a name.no outlines or others...) and try to load metadata and data? 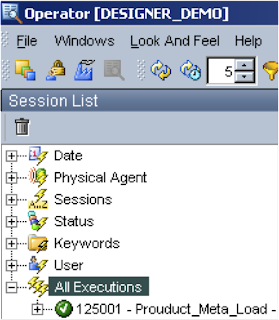 Can we do that or we must have a defined database at essbase? if it is possible can u make an example? 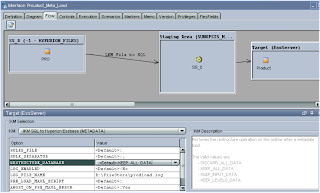 It is not possible to create an essbase database, ODI is more of an ELT tool. The only way you could do it would be to write some JAVA or maybe maxl and then run that from a package. 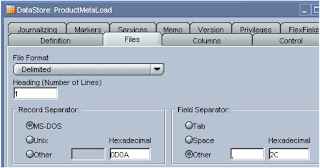 i am practicing loading metadata and data via odi to essbase. 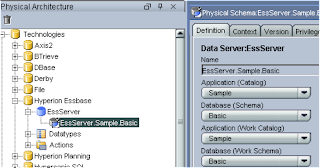 i use Sample-Basic database that comes with essbase. What I want to do is laoding metadata and data to a new database as my previous question. The new outline is empty. So i cant reverse anything for target. I create datastores manually. To load outline i need a rules files. to create rules file i try to use essbase but when i try to "validate" them it says "outline is empty u cant validate". but i am trying to fill the outline. To fill outline i need rules file but to create a rules file i need a complete outline. Where am i doing wrong? Sorry for the delay I did not notice your comment. As I said previously ODI is not intended to create new dimensions, the dimensions need to exist and ODI will be able to populate them. You could use maxl or an API to create the dimensions first and then run an integration to populate them with metadata. First of all, I would like to thank you John, I have been learned a lot with your blog. Regarding Attribute dimension using Hyperion Planning Adapter, I cannot see inside the RKM Model options to define extract my attributes dimensions. Do you know these options are available only to Essbase adapter or also to Planning one? I have a problem that I hope you can help me with. I use two different rules for this, the first one rejects those that have Sub level project put as none, and the latter the ones where sub level is none, hence no sub level. Addning the attributes to the sub level projects is not an issue. However, adding the attributes to the project level, on the ones where no sub project level exists is not working. Is there something I should think extra about when loading on different generations? I use level 0, so it shouldn't be a problem? I'd be so grateful if you could help me with this! Thank you so much for your blog. I have a question. 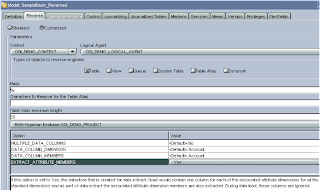 Could I have a legal issue or warranty with Oracle for decompile a jar?.